Now in its 29th year, the Finger Lakes 50s Trail Races is one of the oldest ultramarathons in New York State. The course loops around the Finger Lakes National Forest, winding through lush beds of pines, exposed cow pastures with expansive countryside views, shaded equestrian trails, and some rolling hills through the woods. Runners may choose to run three 16.5-mile loops (plus a half-mile “baby loop”) for 50 miles, two loops for 50k, or a single loop for 25k. Top runners at the ultra distances are traditionally awarded a growler of local craft beer and a chainsaw-carved, wooden cow trophy. The afternoon before the race, as I ran the course to assist with flagging, it was immediately obvious this would be a wet and wild race. Twelve hours before the start there was already plenty of mud and standing water along the route as a result of substantial rainfall over the previous several days. The Finger Lakes 50s course is infamously muddy on any given year, and impending race day storms guaranteed 2017 would be a year to remember! When race director Steve Shaum declared after the bone-dry 2016 race, “Next year there’s gotta be mud,” I doubt this is what he had in mind. Downpours alternated with moderate drizzles all throughout the race, while the sun made an occasional appearance, briefly, as if to taunt us with the idea of a reprieve. 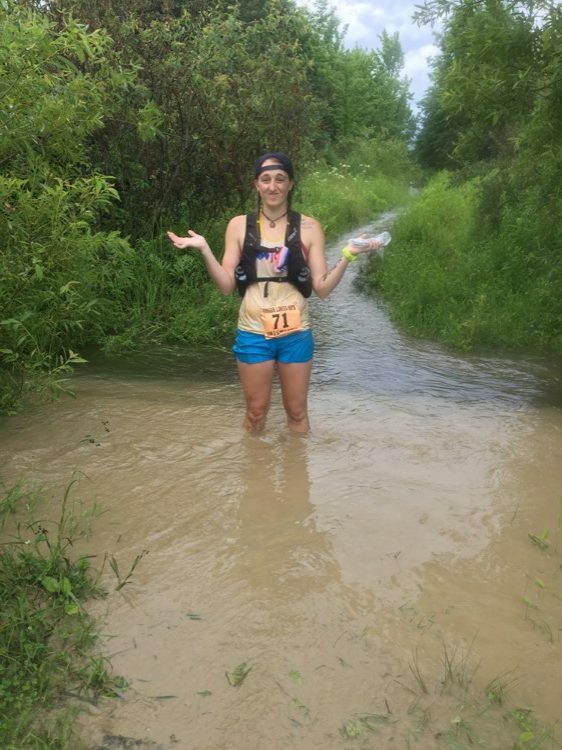 From my position as a finish line and aid station volunteer, I heard reports all day of waist-deep water along the trails. “Course conditions this year were slogging and river-like, to say the least,” said 50-mile finisher Tommy Hayward. “It made my foot placement a mystery. 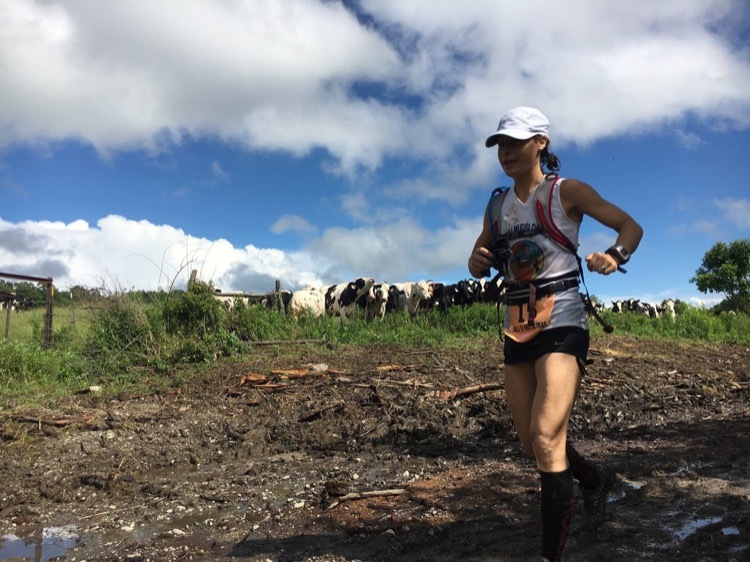 I had to unlock my fear of twisting an ankle and just go for it.” If that wasn’t enough, some runners traversing the cow pastures had their paths blocked by curious bovine, anxious to get a front row seat to the show. Despite the weather and course conditions, Rich Heffron went out fast and finished his first loop in 2:08:54, just ahead of 50k course record pace. Heffron continued to flirt with the course record the rest of the morning, ultimately finishing just three minutes shy. The 50k also saw a few milestones, as Lorrie Tily earned her twentieth FL50s finish, and David Keifer completed his first ultra at 70 years young. Of the 73 runners who’d registered for the 50-mile race only 19 completed the distance. Many dropped down to the 50k mid-race and were counted as 50k finishers. Those who gutted it out received raucous applause as they rounded the final half-mile loop to the finish. Mother Nature thoroughly tested each and every runner’s resolve like a game of chicken, with both parties vowing not to blink first. The runners all seemed to take it in stride, realistically altering their expectations to adapt to Mother Nature’s wrath. “You have a little extra sense of accomplishment because you were foolish enough to start the race, stay on the course, finish it under such conditions, and then earn bragging rights, too,” wrote 50k finisher Tim Hardy. I overheard a few comments from returning FL50s veterans that at least all the rain was keeping their legs mud-free, which is nearly unheard of at this race. The Finger Lakes 50s will turn 30 years old in 2018, and the Finger Lakes Runners Club is planning something special to mark the occasion. Registration for next year’s race will open on January 1, and typically sells out in only a few hours. Great read! So glad I came across this, as I am considering signing up for the 2018 event as my first 50k. What is your opinion on the race as a first ultra? I think the race is very beginner friendly, with generous cutoffs and ample aid stations. (I ran the 50M as my first ultra in 2013.) At 33 miles, The 50k is long, but the course isn’t too technical and there’s only about 1,900 feet of gain and loss per loop. Registration for 2018 opens on January 1, and always sells out in only a few hours, so make sure to get online then if you’re hoping to sign up. The Finger lakes 50(K) was my first ultra in 2007. Great event. Great race to choose for a first ultra. Well organized, challenging but runn-able, great setting.